Select boat name to view details. A long, slim, but richly curving double-ender that is a pleasure to row. Ideal for two rowers. Also has an unstayed leg-o’-mutton rig for sailing in breezes 12 knots or less. 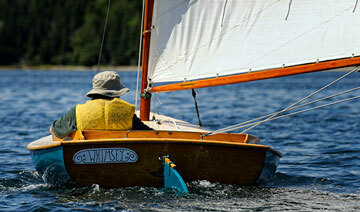 This particular boat was the last West Point Skiff that Alton built and it was donated to WoodenBoat School in 2007. Alumni of the school, along with our shop staff, completely renovated the interior and also added new decks, coamings, and rails over the next two years. The flat bottom aft and the V bottom forward make for a comfortable ride in all sea conditions. The 40-hp motor can push this hull at 25 knots when necessary. 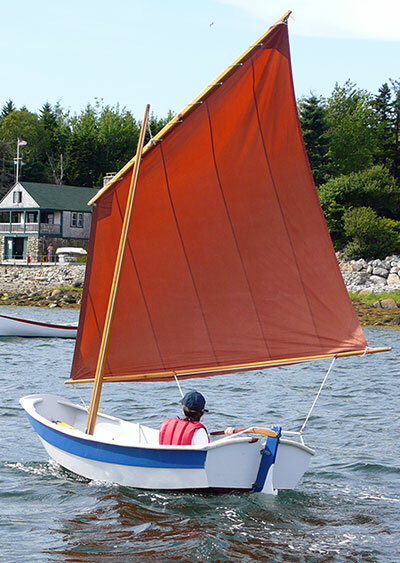 This skiff was built as a replacement for our original launch BABSON. (BABSON II in the foreground; BABSON in the background.) The original boat was built in 1981 by Greg Snead, an employee of Bath Iron Works in Southern Maine. He used the boat for hauling a handful of lobster traps. 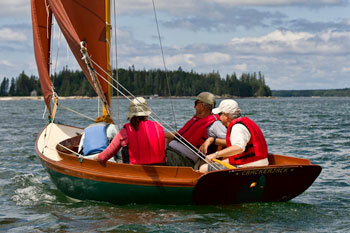 WoodenBoat School purchased BABSON in 1987 and for 28 years had served admirably as our primary waterfront launch. When the decision to retire BABSON was made, it seemed fitting to build a replica hull using the original boat to take patterns, then make some small functional improvements which have led to easier use and improved safety. Our shop and waterfront staff ably maintains her each season. Jon Wilson found smallscale drawings for this vessel in a 1907 issue of Boating magazine (no relation to the contemporary magazine). Taken with the lines, Jon published the original plans in WoodenBoat #2 and later asked Joel White to create working drawings. 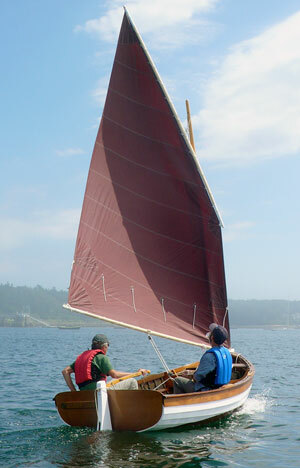 These were eventually given to builder Gordon Swift and WoodenBoat School for actual construction. 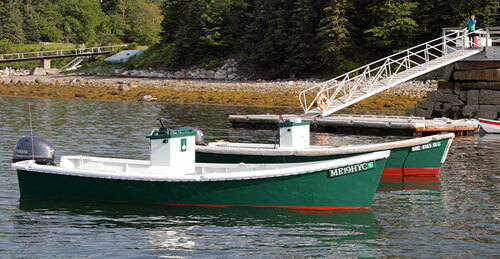 Upon completion, the boat would become a “floating classroom” in the School’s seamanship program. Over six summers (2 weeks a summer for 5 seasons and 4 weeks for 1 season) Swifty led an assortment of dedicated students through the lofting process, set-up, framing, planking, decking, house construction, and rigging. 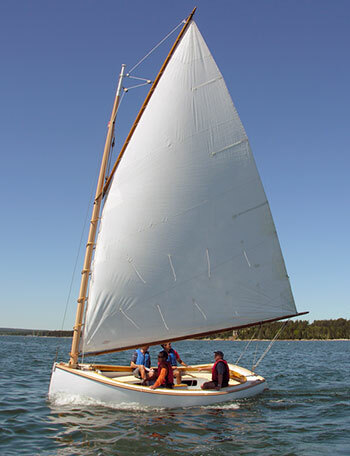 In 1992 the BELFORD GRAY was launched at Brooklin Boat Yard before a large crowd of friends and wellwishers of the School. 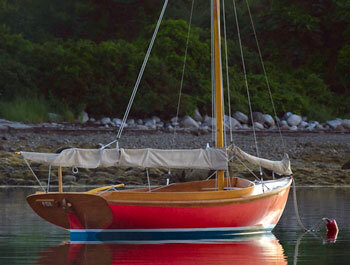 The sloop is named after a highly regarded boatbuilder, instructor, and friend of WoodenBoat School. After a summer of sea trials, a series of seamanship courses have been offered on her each year. With plenty of lines to handle, she has proven herself to be a wonderful teaching tool and is very capable in both light and stiff breezes. With the passing of each sailing season, this Friendship Sloop is fast becoming a familiar and friendly sight in local waters. The BELFORD GRAY is not available to students to use on their own. She is used in sailing courses and by our staff. If interested, ask the waterfront staff when she might have room for crew. This handsome double-ender is one of Iain’s most popular and versatile designs and is guaranteed to turn heads on any waterfront. 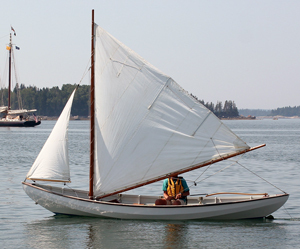 With well-balanced, relatively high ends, this lean and long yawl shows considerable reserve buoyancy above the waterline throughout her length. 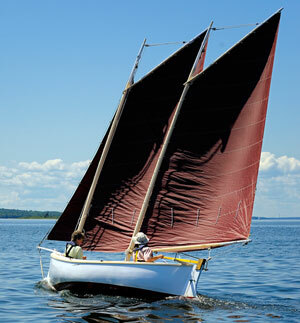 She’s comfortable to sail in a stiff breeze and dazzles in light air and to windward. In steady winds she’ll safely sail heeled over, her crew central and sitting up to windward. Set the mizzen first and it will keep the boat squarely into the wind while you raise the mainsail. To assure positive tacking, simply back the mizzen to the inside of the turn as you come about. The push/pull tiller may take some time to get used to but it works perfectly. Pulling the tiller forward will turn the boat to port. 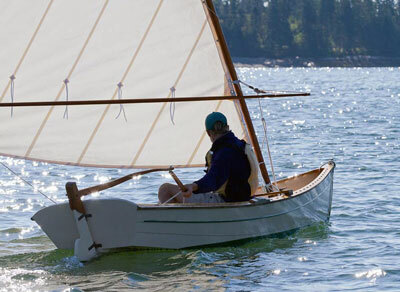 This boat was named in honor of Gordon Swift, an outstanding boatbuilder and long-time instructor at WoodenBoat School who passed away in 2013. 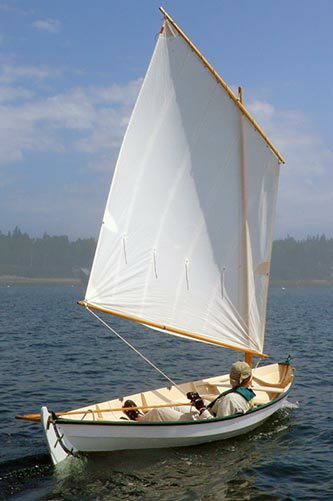 This is an historically accurate 18′ version of the well-known, reputed Mackinaw boat, a sailing and rowing shallop type that was popular on Lakes Michigan and Superior in the late 1800’s. Being long-keeled, she won’t tack very quickly, but with the right breeze, she’ll provide a good turn of speed. This roomy, shoal-draft boat will give a good account of herself in a broad range of wind and sea conditions, and with a variety of loads. A very fast boat, as well as, an exciting sailboat. Ideal for two rowers. With her light weight and narrow beam, she accelerates remarkably well. Joel based this design on a Norwegian workboat. WHISP slides along most easily as a solo boat. 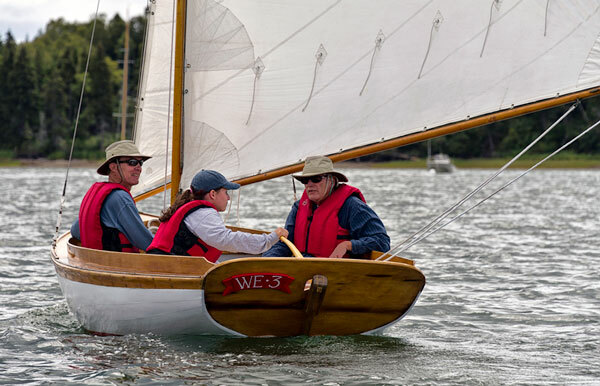 With two aboard, she loses some of her weight advantage, though with her narrow beam and low wet­ted surface she’s still a very pleasant boat to row. Under sail, she seems equally fast with one or two in anything but light airs, and benefits from the stability of a second crew member. Fenwick Williams gave his friend, Maynard Lowery, the plans for this boat just before Fenwick went into a nursing home, saying it reminded him of his youth in Gloucester, Massachusetts. It was the smallest catboat he ever designed. 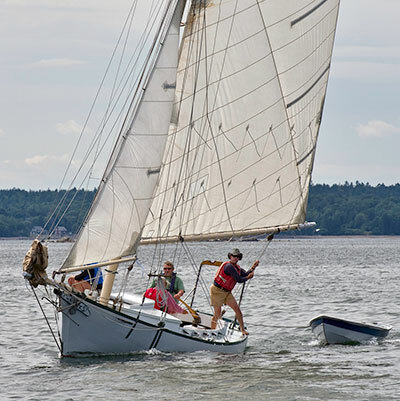 She’s a sturdy, weatherly and extremely stable shoal-draft centerboarder that’s fun to sail. In getting underway, hoist the mainsail before the jib. In lowering the sails, drop the jib before the mainsail; it’s an indication of good seamanship and helps prevent the boat’s bow from blowing off downwind after you’ve picked up the mooring. Jib outhaul must be tightened up when sailing, and then slacked off in order to properly furl. Pump, sponge, and oarlocks are stowed in the lazarette. HAVEN 12½’s — ALLENE and CONNIE L.
In getting underway, hoist the mainsail before the jib, and take up on the peak halyard until diagonal wrinkles appear, running from peak to tack. In lowering the sails, drop the jib before the mainsail; it’s an indication of good seamanship and helps prevent the boat’s bow from blowing off downwind after you’ve picked up the mooring. 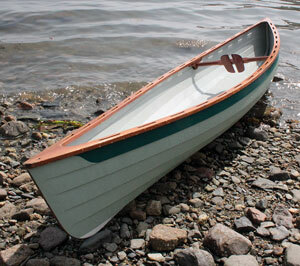 This lovely rowing boat was taken from the lines of an old tender (ca. 1910) by Rice Brothers that is now in the Maine Maritime Museum in Bath. This boat’s construction was altered to that of a classic working Whitehall and building her this way yielded the first-hand experience and photos needed to produce an authoritative book on the subject (at Mystic Seaport Museum). The Whitehall has always been a favorite of amateur builders and many, many plans of this boat have been sold. 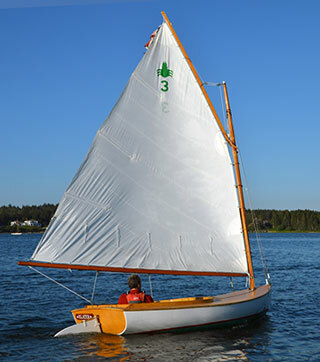 This handsome dinghy is an ideal family daysailer. It is stable, will carry up to four people, sails well, and will provide plenty of delight to all on board. 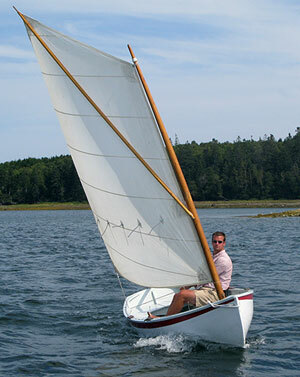 Designer:Robert Elliott — this particular dory is a hybrid between the straight-sided Banks Dory and the round-sided Swampscott type. 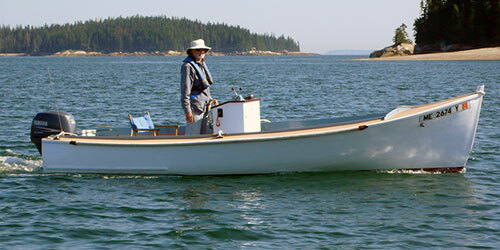 This is a handsome, stable dory that is a fun boat to row. 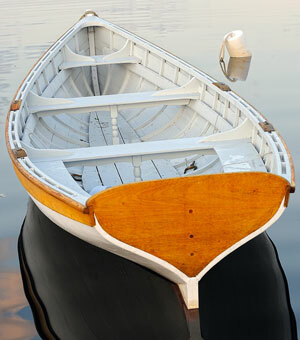 Traditionally used as workboats, dories, if properly handled, provide a wonderful source of pleasure and exercise to the oarsperson. Very responsive and quick. Take along a couple of cushions to sit on for more comfort. 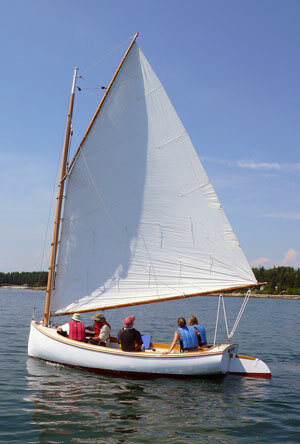 Construction of boat was featured in WoodenBoat #96, #97 & #98. In getting underway, hoist the mainsail before the jib. In lowering the sails, drop the jib before the mainsail; it’s an indication of good seamanship and helps prevent the boat’s bow from blowing off downwind after you’ve picked up the mooring. Just who built the original design and when are not known for sure, although it is reputed to have been built about 1880 at Northport, Maine, by a member of a Northport boatbuilding family by the name of Drinkwater. It shows a strong resemblance to boats used for recreational rowing in the 1880’s on the Charles River in Boston. 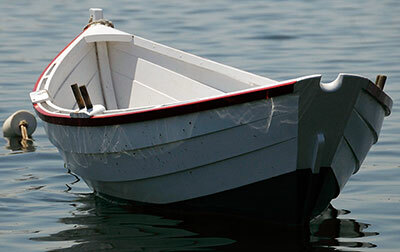 The skiff is not heavy for its size and is a very speedy rower, although a bit tender. 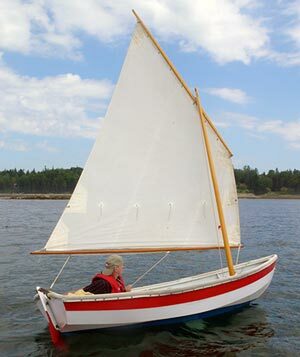 Builder: Concordia Co. — WoodenBoat School cold-molded over WHIMSEY’s original hull in 1993 to add strength and eliminate the need for refastening. 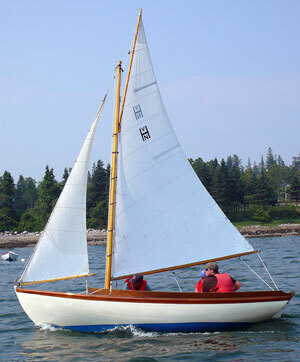 This is the classic yacht club racing boat and wonderful craft to learn the art of small boat sailing. A good-size sail makes it a fun boat to sail. Take along a couple of cushions to sit on for added comfort. She sails best with the gaff well peaked up. 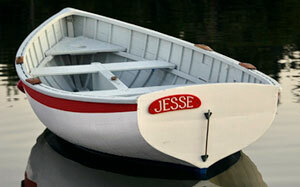 JESSE is an all-purpose boat. Safe, stable; she’s easy to row and makes a nice sailing dinghy to boot. 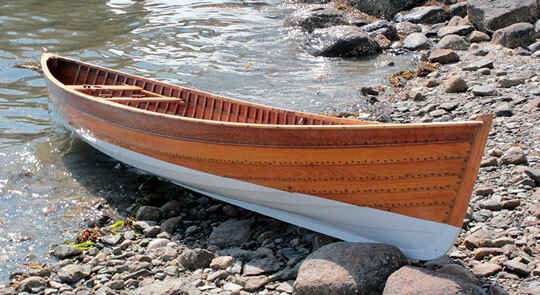 She goes best under fairly sizable oars — 7½′ or better and has two rowing stations. This is a jewel of a boat! She’s very nice to paddle with double-paddle and fun to sail with her complicated little rig (for light airs only). Please treat this boat with special care—she’s worth it. 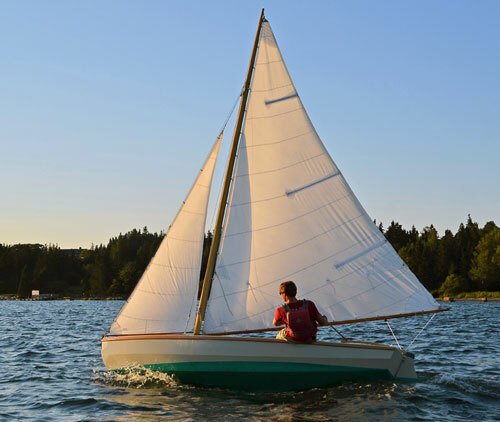 Comments: Jon Wilson says, “The Shellback provides an education in the fine points of sailing, rowing, and sculling for sailors of all ages, her standing lug rig easily dropped altogether if the winds come on too strong. She is not easily adapable to outboard power, primarily because the weight of the motor throws her fine hull out of trim, but she rows well enough to provide plenty of efficiency and speed, even with a load.” Sailed correctly these Shellbacks are very quick and responsive. For comfort and safety, adult sailors should sit on the floor, not thwarts, when under sail. 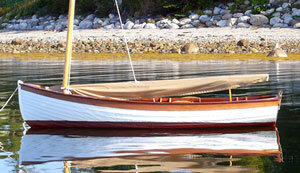 With its classic design influence, the famous Rushton ”Wee Lassie“ is one of Tom Hill’s most popular canoes. A finely made spoon-bladed double-paddle can make this little craft really fly. She is an unusually enjoyable solo boat, yielding that exhilarating experience of personal freedom so necessary to the lone paddler. She has enough additional capacity for 2 or 3 weeks’ gear, too. This boat is a perfect choice for gliding silently over a clear body of water. 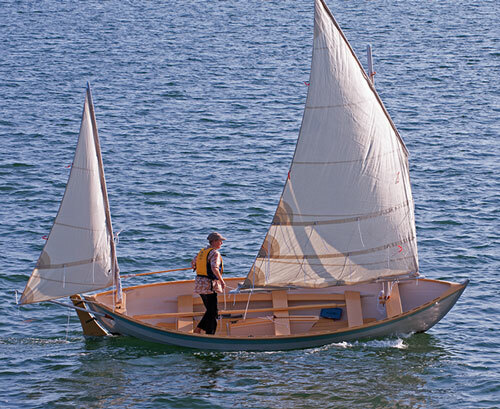 This great little double-ended craft is a more able version of J. Henry Rushton’s Wee Lassie model. It is small and light as to be easily portable, yet able to carry its paddler over long distances, be safe in choppy conditions, and be exceptionally maneuverable in confined waters. Weight: 90 and 100 lbs. Excellent rowing and sailing dinghy for beginners on up. As in most boats this size, trim is very important; try to keep her level fore and aft, perhaps a little bow high when going to weather. When rowing with one passenger aboard, use the forward rowing station.